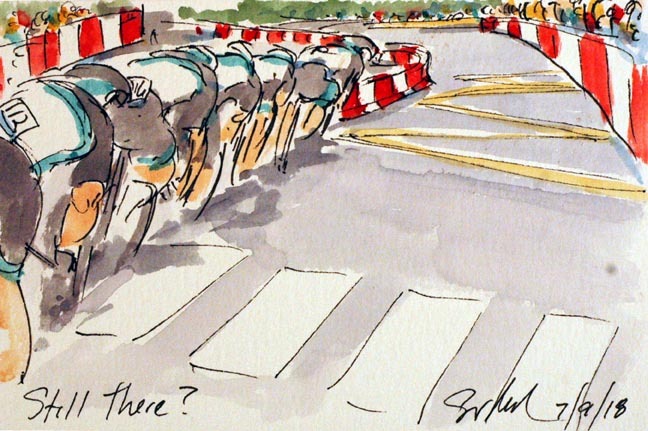 The Art of Cycling: Tour, Stage 3 TTT: Still There? Tour, Stage 3 TTT: Still There? That was the question after the short steep climb ahead of the second time check. Unfortunatley for Bora-Hansgrohe, the Maillot Jaune of Peter Sagan wasn't. With the GC hopes of Raphael Majka on the line, those left together, including Daniel Oss and Maciej Bodnar couldn't afford to wait for Sagan. Don't worry, while he lost the yellow jersey, he held fast to the jersey he has won six times before, the Maillot Vert of most consistant sprinter.